With contributions from a wide array of scholars and activists, including leading Chicana feminists from the period, this groundbreaking anthology is the first collection of scholarly essays and testimonios that focuses on Chicana organizing, activism, and leadership in the movement years. 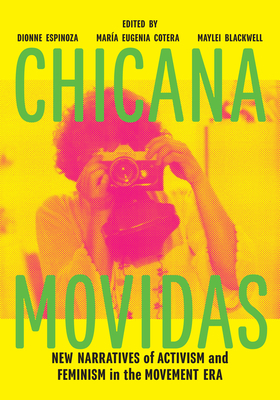 The essays in Chicana Movidas: New Narratives of Activisim and Feminism in the Movement Era demonstrate how Chicanas enacted a new kind of politica at the intersection of race, class, gender, and sexuality, and developed innovative concepts, tactics, and methodologies that in turn generated new theories, art forms, organizational spaces, and strategies of alliance. These are the technologies of resistance documented in Chicana Movidas, a volume that brings together critical biographies of Chicana activists and their bodies of work; essays that focus on understudied organizations, mobilizations, regions, and subjects; examinations of emergent Chicana archives and the politics of collection; and scholarly approaches that challenge the temporal, political, heteronormative, and spatial limits of established Chicano movement narratives. Charting the rise of a field of knowledge that crosses the boundaries of Chicano studies, feminist theory, and queer theory, Chicana Movidas: New Narratives of Activisim and Feminism in the Movement Era offers a transgenerational perspective on the intellectual and political legacies of early Chicana feminism.